The legal proceedings seem to go on forever, but actually it was only about nine years. Toward the end, when we finally got the case heard after it seemed like 500 continuances, we had a break from the courtroom drama. Walking the halls of the Broward County Courthouse, we happened to look through the peep hole in the door of another court room. We saw a not-so-young guy in front of a jury. He was crouched, like a guard in a basketball game—arms extended, weaving from side to side, obviously making some important point. We had rarely seen a lawyer so animated, especially one who obviously wasn’t working his first trial. “How much time do we have?” we asked. We went into the court room and watched a man with the reputation as one of the best in the field of medical malpractice do his stuff. We saw enough to get inspiration—a story for the Sun Sentinel’s Sunday magazine, Sunshine, for which we had written on a fairly regular basis. We decided to follow the trial, which involved Broward General Hospital, and in the course of it approached Shelly Schlesinger about doing a story. He was wary. In fact, we did not talk to him directly; rather his co-counsel. We did not get a quick answer. We suspect he was checking us out, and when the answer came it was OK, but only after this trial was over. We eventually met in his office, at the time a converted house on Third Avenue, close to the spectacular courthouse-style building on Davie Boulevard that was soon to house his firm. By then we had gained his trust, and the interview was one of the most interesting and easiest we ever had. He told us how he began after law school at the University of Miami. He hung up his shingle and got three cases. One was a domestic dispute, which he detested. Can’t recall the second, but it bored him. The third was a medical issue, by far the most interesting of the cases. He decided to make it his specialty. Medical malpractice was not a common legal category in 1954. Schlesinger literally helped invent the specialty. His most notable cases were often theater. He could exude charm at times, but in describing a child trying to breathe after a medical error, he could appear on the verge of a coronary. You could almost see jurors trying to breathe themselves. One of his most famous cases was Susan Von Stetina. Every Sunday for years we heard prayers for her at St. Anthony Church. Schlesinger arranged a visit with the woman, or what was left of her. She had been in a vegetative state for more than a decade after a respiratory failure in a busy emergency room. Old photos showed a pretty young girl. The woman we saw was pasty and inert—not recognizable as the same person who had been in an auto accident. It became known as a $38 million case. After that visit, we had interviews with medical people who knew him well (and not always happily), as well as other lawyers who uniformly revered him. We learned that the worst mistake doctors made was challenging him, a lawyer, when it came to their medical expertise. When they got sniffy or condescending, he destroyed them. He often seemed to know more about medicine than the doctors he faced in court. That piece wrote itself. 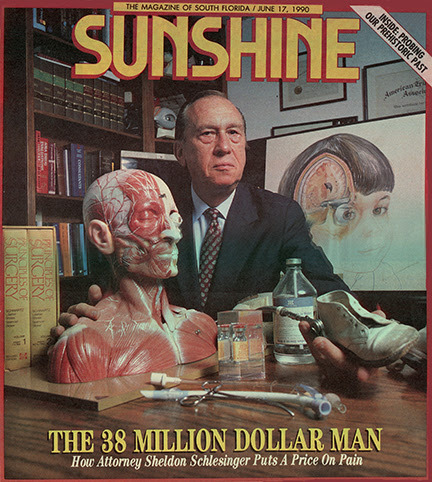 Sunshine made it a cover story. Schlesinger liked it, and not long after suggested we help him write a book. He gave us some money to get started, but after we knocked off an introduction he changed his mind. He did not want a book that glorified his career. Instead, he graciously turned the money into an investment in a new company we were forming. We had won our case and needed to revive Gold Coast magazine. In short order Fred Ruffner came along. Instead of investing, he bought the magazine, which had published only one unimpressive issue. Our handful of investors, including Scheslinger, made a few quick bucks. Eighteen months later Fred Ruffner was losing money like foam over a waterfall, and wanted to sell it back to us. His investment and good taste had restored the magazine’s credibility. But we needed to raise serious money fast. Son Mark McCormick was joining our effort. Over the years in this business you meet some credit-worthy people, and we decided to approach successful men who had sons who could represent them on a new board. Dads would invest and it would be nice association for the young people. Shelly Schlesinger was one of the first we approached. He had two sons who had joined him in his firm. It took just a few minutes to explain the father-son concept. “How much are you looking for?” he asked, cutting to the chase. “We’re thinking about $25,000,” we said. “I’ll go two bits,” he said, that quickly. We saw little of Shelly Schlesinger during the last 20 years, but his lawyer son Gregg, on our board, kept him advised. Last spring he called. He had read about the 50th anniversary of the magazine. He said how pleased he felt to have been part of it these last two decades. He said he knew how difficult it was to keep a business going that long. He may have been thinking that his own law practice was more than 60 years old, and that he would leave behind a reputation as one of the giants in his field. And that he has done, as of Wednesday. He came to work, age 85, probably dressed in a jacket and tie that he usually wore. He did not go home. He died with his boots on, as they say.